The Canyon of Heroes, a stretch of Broadway where the nation's largest city has honored its legends, will come to life on Friday for the Women's World Cup winners. When the U.S. women's soccer team ride floats through the swirling ticker tape to a ceremony at City Hall, they will be the first national team since 1984 and the first women's team ever to be honored with the iconic parade. For more than a century, tens of thousands of New Yorkers and visitors have made the pilgrimage to Lower Manhattan to honor world leaders like Nelson Mandela, heroes like Neil Armstrong and athletes like gold medal winner Jesse Owens. But since 1999, the honor has been bestowed solely on local championship-winning teams like the Yankees and Giants, meaning Friday's parade will be a break with precedent. "It's going to be magical," said Mayor Bill de Blasio on Thursday. "The Canyon of Heroes is one of the great New York traditions." 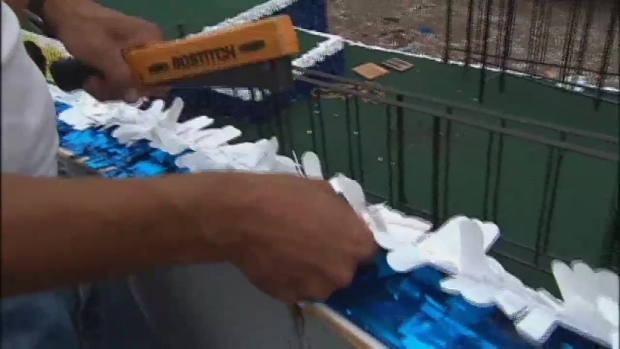 At Bond Parade Floats in Clifton, New Jersey, crews say they're prepared to work through the night to finish the floats by 4 a.m.. They say this is as tight a deadline as they can remember facing, but it helps that they have a blueprint: they've created floats for the Yankees, the Giants and the Rangers when they took their turns down the Canyon of Heroes. John Chandler reports. "The magnitude of the U.S. victory, what it means not just for women's soccer, but (as) a statement it was to the world to the growing powerful role of women in this country," said de Blasio. "It was crucial for New York City to honor this extraordinary team." The U.S. squad defeated Japan 5-2 on Sunday in Canada to win its first World Cup since 1999. The women were feted at a rally in Los Angeles this week and have been invited to the White House. All 23 members of the team — none of whom are from New York City, though four hail from nearby New Jersey — are expected to attend the parade. The southern end of Broadway is the traditional spot for New York City ticker-tape parades. Most of the route is lined with tall office buildings on both sides, allowing workers to toss scraps of paper on the celebrants below. Among the famous people honored: Theodore Roosevelt, John F. Kennedy, Dwight Eisenhower, Gen. Douglas MacArthur and Albert Einstein. City officials have not issued an expectation for size of the crowd, though tens if not hundreds of thousands of people will likely line Broadway for the 11 a.m. parade. It will feature floats and marching bands, and will be hosted by broadcaster Robin Roberts and former soccer star Heather Mitts. At its conclusion, the team will be honored by de Blasio in front of a crowd of 3,500 people at City Hall Plaza. At Bond Parade Floats in Clifton, New Jersey, crews say they're prepared to work through the night to finish the floats by 4 a.m.. They say this is as tight a deadline as they can remember facing, but it helps that they have a blueprint: they've created floats for the Yankees, the Giants and the Rangers when they took their turns down the Canyon of Heroes. The Downtown Alliance packed 2 tons of shredded paper -- the ticker tape -- into garbage bags to distribute to buildings overlooking the Canyon of Heroes. The parade is expected to cost about $2 million, in line with what the most recent parade — the Giants in 2012 — cost. City officials have said that about $450,000 of the cost will be covered by private donations and corporate sponsors like Nike and Electronic Arts. The Department of Sanitation will have more than 400 workers assigned to parade cleanup, and they'll utilize 14 collection trucks, 10 front-end loaders, 100 backpack blowers and 66 rakes. More than 56 tons of debris were collected from city streets after the 1999 Yankees World Series win.